Widespread, uncommon permanent resident, ranging from sea level to alpine meadows. Found in nearly all habitats, except xeric regions of the Mojave and Colorado deserts that do not support mule deer populations. Excluded from croplands in the Central Valley (Ingles 1965). Most abundant in riparian areas, and brushy stages of most habitats. Recent studies by the California Department of Fish and Game, and others (see Sitton and Wallen 1976, Koford 1977), suggest that 2500-5000, or more, mountain lions currently live in California. Numbers appear to be increasing. Feeding: Carnivorous. Mule deer make up 60-80% of diet throughout year (Currier 1983). Also eat rabbits and hares, rodents, porcupines, skunks, coyotes, and, occasionally, domestic stock. Grouse, turkey, fish, insects, grass, and berries also have been reported in the diet (Spalding and Lesowski 1971, Russell 1978, Currier 1983). Usually stalk prey on ground, often locating by scent. Kill larger prey by stalking within a few meters, and then leaping onto it and biting at base of skull. Cover: Caves and other natural cavities, and thickets in brush and timber provide cover. Reproduction: Caves and other natural cavities, and thickets are used for denning. Water: Apparently capable of existing for long periods without drinking water. Pattern: Require extensive areas of riparian vegetation and brushy stages of various habitats, with interspersions of irregular terrain, rocky outcrops, and tree/brush edges. Activity Patterns: Active yearlong; mostly nocturnal and crepuscular. Seasonal Movements/Migration: Seasonal movements within a fixed range commonly are in response to prey movements. Follow migrating deer herds. Home Range: Male home ranges usually are a minimum of 40 km² (15 mi²) (Russell 1978). Female home ranges usually are 8-32 km² (3-12 mi²). In Idaho, Hornocker (1970) found home ranges of males varying from 65-250 km² (25-96 mi²); those of females varied from 13-52 km² (5-20 mi²). Home ranges of females may overlap completely with those of other females, or with males. However, females with young usually occupy distinct areas (Sitton and Wallen 1976). Males usually occupy distinct areas, and are tolerant of transients of both sexes. Young adults establish home ranges as vacancies occur (Seidensticker et al. 1973). Territory: Mountain lions tend to mutually avoid each other, but there is little evidence that they regularly defend a territory (Maser et al. 1981). Reproduction: Females may be in estrus at any time of the year, but in California, most births probably occur in spring. Gestation period 82-97 days; litter size 2-4 (range = 1-6) (Currier 1983). In California, weaning occurs in about 8 wk (Bruce 1922), and young become independent during second yr. Some females breed at 2.5 yr, some not until fourth yr. Most females produce litters at 2-yr intervals. Reproduction is limited to the resident male, who breeds the 1 to several resident females whose home range overlap his. Transient males usually do not breed until a home range is established. Wild mountain lions probably do not often live longer than 8-12 yr (Young and Goldman, 1946). Niche: Few predators other than humans, although large hawks, eagles, and bears may take a few young (Russell 1978). Potential competitors (based on dietary overlap) include bobcats, coyotes, bears, and wolverines (Russell 1978). May carry rabies, Trichinella larvae, various tapeworms, and may contract feline panleukopia. Populations associated closely with deer populations (Nowak 1976). Fragmentation of habitats by spread of human developments and associated roads, power transmission corridors, and other support facilities, restricts movements and increases association with humans. These changes are detrimental to mountain lion populations. Comments: F. c. browni, the Yuma mountain lion, is a California Species of Special Concern (Williams 1986). Inhabits Colorado River Valley. Bruce, J. 1922. The why and how of mountain lion hunting in California. Calif. Fish and Game 8:108-114. Christensen, G. C., and R. J. Fisher, eds. 1976. Transactions of the mountain lion workshop. USDI, Fish and Wildl. Serv. Reg. I, Portland, OR. 213pp. Idaho Primitive Area. Wildl. Monogr. No. 21. 39pp. Koford, C. B. 1977. Status and welfare of the puma (Felis concolor) in California, 1973- 1976. Final Rep. UC, Berkeley, School For. 57pp. Maser, C., B. R. Mate, J. F. Franklin, and C. T. Dyrness. 1981. Natural history of Oregon coast mammals. Pac. Northwest For. And Range Exp. Sta., USDA, For. Serv., Gen. Tech. Rep., PNW-133. 496pp. Nowak, R. M. 1976. The cougar in the United States and Canada. USDI Fish and Wildl. Serv., Office Endang. Species, Washingtion, DC. 190pp. Robinette, W. L., J. S. Gashwiler, and O. W. Morris. 1961. Notes on cougar productivity and life history. J. Mammal. 42:204-217. Russell, K. R. 1978. Mountain lion. Pages 207-225 in J. L. Schmidt and D. L. Gilbert, eds. Big game of North America. Stackpole Books, Harrisburg, PA. 494pp. Seidensticker, J. C. IV, M. G. Hornocker, W. V. Wiles, and J. P. Messick. 1973. Mountain lion social organization in the Idaho Primitive Area. Wildl. Monogr. No. 35. 60pp. Sitton, L. W., and S. Wallen. 1976. 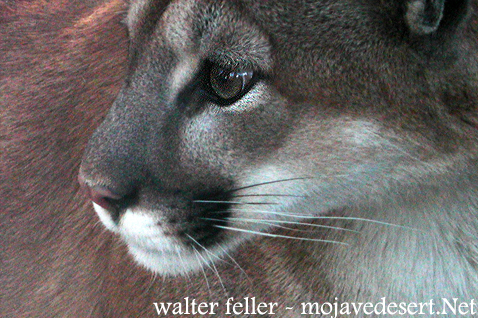 California mountain lion study. Calif. Dep. Fish and Game, Sacramento. 40pp. Spalding, D. J., and J. Lesowski. 1971. Winter food of the cougar in south-central British Columbia. J. Wildl. Manage. 35:378-381. Young, S. P., and E. A. Goldman. 1946. The puma, mysterious American cat. Amer. Wildl. Inst., Wash., DC. 358pp. The Mountain Lion is the largest of the wild cats in North America. A male lion can average 130 – 150 pounds and a female 65-90 pounds. Mountain Lions are a tawny to grayish color. They are dark brown at the tip of their long tail. They are also dark brown on the back of their ears and on the sides of their nose. Mountain Lions prefer to live in areas of rugged mountains and forests, but will adapt to areas of rolling hills with little cover and the desert. A home range for an adult male lion can be over 100 square miles. Females travel a smaller range of 20 to 60 square miles. 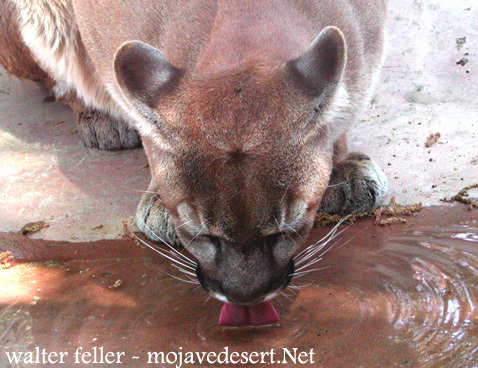 Mountain Lions are true carnivores, feeding only on other animals. The preferred food of the Mountain Lion is mule deer, or occasionally a bighorn sheep, but a lion will make a meal of any small animal, such as coyote, fox, raccoon, rabbit, rodents, and birds. Lions often keep a carcass covered with dirt, leaves or snow and return to feed on it over the course of a few days. Mountain Lions breed first at 2 or 3 years of age and then every 2 or 3 years. Mountain Lions mate for the season. Their young may be born any month of the year. They may have 1 to 6 kittens but 2 is the most typical litter size. Mountain Lions prefer the evening cover for hunting, people rarely see them. Even during daylight hours while lions are traveling about, their calm and quiet demeanor allows them to pass through without detection. Lions are solitary and secretive.